Close to the visionary Sun Corridor, the Port of Tucson is a thriving logistics operation located right on the Union Pacific Railroad’s main east-west line across the United States. Due to intense global competition, shipping giants APL and Hanjin are considering a deal that would divert millions of dollars of cargo business from California to the intermodal center at Interstate 10 and South Kolb Road. “For transportation infrastructure, the future is in international containers. Instead of going into the Long Beach terminal, these two carriers would ship directly from Asia to the Port of Tucson,” said owner Alan Levin. His 350-acre site is in a foreign trade zone. Despite the exciting prospect of securing this new business, Levin faces a daunting challenge: financing. To accommodate the new clients would require a $19 million investment in new infrastructure. And that problem was exactly what state Rep. Vic Williams, R-Tucson, wanted to hear. As chair of the House Transportation Committee, Williams led a special forum Nov. 4 at Marana Town Hall. He wanted to hear from businesses about their infrastructure needs in the Phoenix-to-Tucson-to-Mexico Sun Corridor. “I am adamant about reaching out to the private sector. Part of the process is private sector employers telling us what they’re looking for to help facilitate economic development and job growth,” he said. Clearly, Levin’s comments were the highlight of the meeting. He also is working on a Houston-based deal to enable direct shipments to and from Europe. “Every boxcar we do takes four trucks off the road. And if a container never sees asphalt, it can carry more capacity,” he said. During the four-hour forum, several long-term ideas that focused on establishing hubs of industry and job creation unfolded before the 100 attendees. Around Raytheon Missile Systems main plant and Tucson International Airport, for example, will be the aerospace core. In Vail, science and tech has a cluster industry. In Oro Valley, its biosciences. The group also reached an informal consensus about financing. The road-rail-air corridor will not be funded by the federal government. To pay for the transportation infrastructure, Southern Arizona needs a more diversified economy. Historically, the region has been too dependent on housing and development, and government and university jobs. 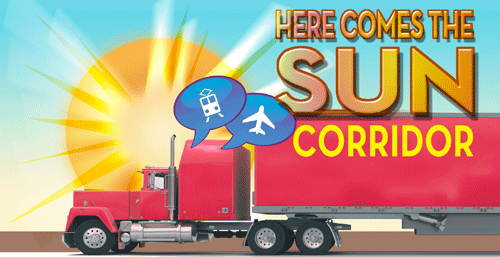 Proper development of the Sun Corridor will attract out-of-state commerce and new tax revenue. Support services, such as warehouse and distribution operations, will benefit Southern Arizona because of its strategic location between Texas and California from east to west, and Canada and Mexico from north to south. Mary Peters, former U.S. Secretary of Transportation, stressed that funding will have to include private sector investment and other non-traditional sources. The public and private sectors will have three financing options. Two are obvious, to identify new funding sources and to aggressively manage the business assets that already exist. Editor’s note: For information on space available at Century Park Research Center, home of the Port of Tucson, contact Russ Hall, PICOR.